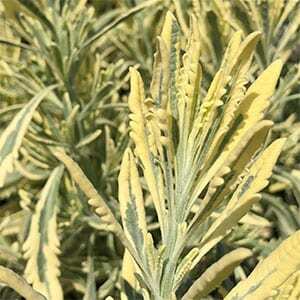 A Lavender with a difference, Lavender Allardi Meerlo has variegated foliage, it grows better in humid climates than many others, and has fragrant foliage as well. With a natural upright habit the foliage is a year round feature, it will flower in summer with typical lavender blue spikes rising above the foliage. With outstanding folaige colour, this is a little different to other Lavender varieties and well worth seeking out. Planted in a humus rich well drained soil, Meerlo Lavender is remarkably maintenance free. Prune it directly after flowering to help maintain a bushy compact habit. It is a plant that can be grown in the general garden border, or try it in a container if desired. If growingMeerlo Lavender as a hedge, try planting at around 45cm (18 inches) apart, or closer for a faster effect. Common Name – Meerlo Lavender .